Preventing the worst catastrophes of climate change will require a fast and radical restructuring of our society and economy. Not only a switch to 100% renewable energy, but also huge, disruptive changes in transportation, housing patterns, agriculture, manufacturing, and more. “Just transition” is the goal of making these changes in a way that promotes justice — both overcoming current injustices and preventing injustices that could result from all these disruptive changes. People use the term “just transition” to talk about several intersecting issues. 1. The term comes out of the labor movement, from a visionary leader named Tony Mazzochi, former president of the Oil, Chemical, and Atomic Workers Union (now merged into the United Steelworkers). Mazzochi said that when workers lost their jobs as a result of environmental policies, which he embraced, society should take responsibility for providing them with income support, job retraining, early retirement, and a range of other benefits. This concept was soon expanded to include measures to support communities like California’s refinery towns, which are dependent on economic activity and tax revenue from industries that need to be closed. 2. 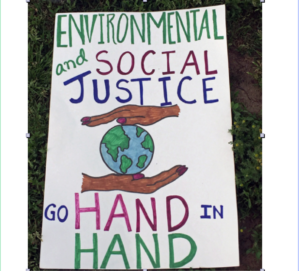 More recently, the climate justice movement and people in “frontline communities,” (those near sources of pollution and greenhouse gases) have been using the term “just transition” to mean prioritizing the needs of vulnerable communities — and building their economic, social, and political power. 3. Another aspect of just transition is “energy democracy” — the goal of taking democratic control of our energy system, taking it away from the corporations that are using it to destroy the planet. 4. Less often included in the term “just transition,” but also a central justice issue, is the effort to make sure that policies to protect the environment don’t add to current injustices. For example, countering the gentrification that often happens as a result of “transit oriented development” (building new housing near transit facilities). And protecting lower-income people from the effects of increasing energy costs. Here are some articles explaining each of these key ideas, followed by a list of articles that give examples of just transition policies and practices. 4. Making sure policies to protect the environment don’t worsen current injustices. >Recent Washington ballot measure (defeated): https://ballotpedia.org/Washington_Initiative_1631,_Carbon_Emissions_Fee_Measure_(2018)#Text_of_measure.